Pets Costs > How Much Does a Pet Bobcat Cost? How Much Does a Pet Bobcat Cost? Bobcats belong to the wild feline family, along with animals such as panthers, tigers, and leopards. Although these cats have dominant personalities compared with other domestic cats, bobcats can still offer an intense affection when they are handled well by their owners. Owning a bobcat animal can be a daunting task for any inexperienced pet owner. It is not like buying a puppy from a pet store. Raising a bobcat entails a much larger responsibility as it is considered as a wild exotic animal. How much is a pet bobcat? Since a domesticated bobcat is considered to be an exotic animal, you have to remember that most cities and counties have restrictions. In the end, if it’s legal and you have the means to raise one, plan on budgeting anywhere from $900 to $2,500 for the bobcat alone. This price, of course, won’t include the future recurring and starter costs. According to BigcatRescue.org, exotic cats are known to be expensive, and a bobcat is no exemption. According to the website, if you could find one, a Bobcat kitten is usually priced around $900. KeystoneExotics.com, an online pet store that had bobcats for sale at the time of this writing, offers bobcat kittens for $1,500, and an additional $350 will be charged for shipping. A handful of active listings were up on ExoticAnimalsforSale.net, with prices ranging anywhere from $1,800 to $2,500. Depending on the breeder, most should already have it spayed/neutered, be up to date on its vaccines, and they should include a medical history, health guarantee, and a vet certified checkup. A travel crate will also be included if it’s going to be shipped. A bobcat will need a habitat similar to its natural surroundings. This will include both an outdoor and indoor setup, consisting of a larger perimeter fence to prevent it from escaping. Their enclosure should be as large as possible to make it feel as if they were in the wild. This can include multi-level ramps and perches to climb. These costs can be pretty high, especially if you don’t have the acreage to house your bobcat. Noahfcc.com, for instance, says the indoor enclosure should be at least 600 square feet. As per BigcatRescue.com, good food and vitamins for a mid-size cat can cost you at least $700+ per year, and for a larger-than-average bobcat, the costs can be closer to $2,000 per year. After the first 12 weeks, when the kittens are done nursing, a bobcat will eat meat such as chicken, rabbits or turkey. Depending on the meat it eats, vitamins may be required to supplement their nutrition. Experts recommend feeding every other day to simulate wild conditions. A larger van used to transport your bobcat to vet appointments will something to consider as well; thus, a minivan might be needed. A bobcat, just like any other household pet, will need its annual shots from the vet in order to ensure its health. This can cost around $125 to $250, depending on the size of the cat and won’t include the travel fees. In addition, vaccinations must be done to prevent the bobcat from contracting rabies and other diseases. Not to mention that you need to spend money for de-worming and getting rid of fleas that might lurk in the fur. Since most vets probably won’t allow a bobcat in their offices, you will more than likely have to pay a vet visit fee as well. Most states will require you have a permit in order to legally house one, and the costs can greatly depend on where you live. Some states may only offer these permits to those who own zoos. The average bobcat, when full grown, will reach 30 to 50 inches tall and can weigh about 15 to 30 pounds, with a male weighing a smidge more than a female. With large tufts of fur on the face, the bobcat’s fur can be yellowish-brown, reddish-brown, grayish-brown or orange-brown, with black streaks and spots spread throughout the coat. Twice per year, the bobcat will molt. 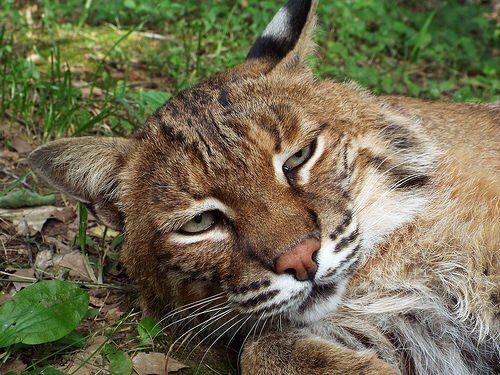 According to the NOAH Feline Conservation Center, bobcats are predatory in nature. They are armed with sharp teeth and claws. Thus, having them around small children is a threat since kids cannot be trusted to show good judgment reliably. A pet bobcat is not recommended for families with younger children. Because of the nature of a bobcat, it is suggested that you only have a bobcat as a pet if you have had it since a kitten. If the bobcat is raised elsewhere and then its surroundings and habitat change, it could revert to its wild nature. Also, it is never suggested to get a bobcat that was born in the wild. Only keep a bobcat that has been bred in captivity as a pet. If the breeder does not offer a health guarantee, then consider this a red flag. A good breeder will always stand behind their litter. According to BigcatRescue.com, some states have cage requirements of varying standards for your pet bobcat. Some states require no less than five acres if you want to own a big cat such as tigers and bobcats, and most are going to require some sort of permit. Some states even ban the keeping of a bobcat as a pet. Checking with your local government to know the legalities before hiring one. During the night, a bobcat can let out an eerie-like scream. You can check the internet to see if there are big cat breeders near your location. If there is, visit them personally and check the cats there. You can greatly save money by buying a bobcat from a local dealer rather than ordering one through the internet. This would save you money on costly shipping charges. As mentioned, you can also buy from local humane society and rescue centers. You can adopt a grown or baby bobcat at a price below a hundred dollars.